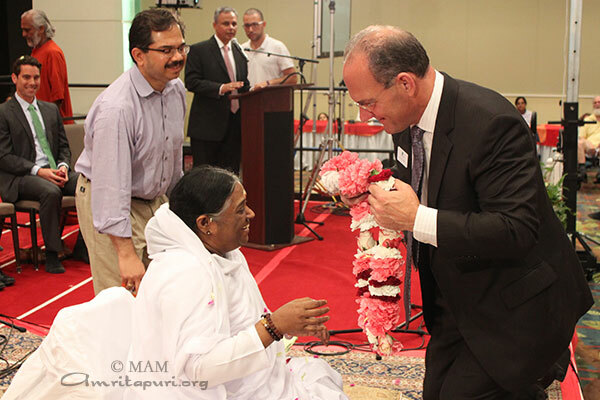 Amma and the group arrived in Detroit on Nov. 24th with the programs beginning the very next day. If it was rain in San Ramon, it was the first snow shower for the season in Detroit. 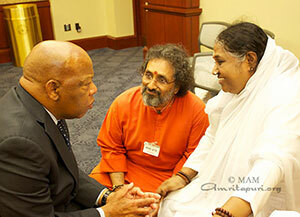 Seemed like Mother Nature wanted to join Amma in showering love on Her children. The five-day visit to Michigan comprised of two days of public programs and a three-day retreat. 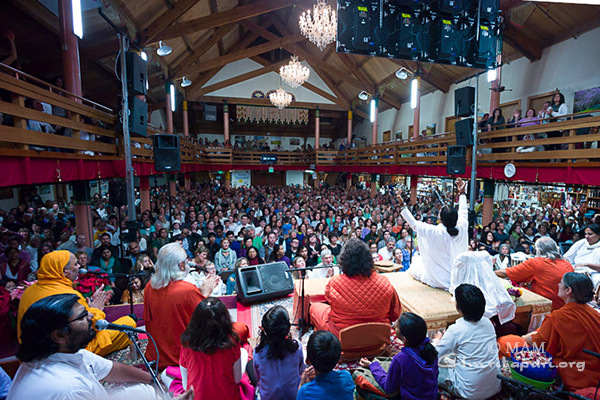 It was the time for Amma’s east coast children to come together, some even driving for 16 hours in the wintery conditions. On the second day, the students of Kala Kshetra, a fine arts school based in Michigan, put on a beautiful set of cultural programs. The performances ended with traditional Kerala “chenda” performance by a group of men. As they went to get Amma’s darshan later, Amma exclaimed to them “Amma saw Kerala, right here”. The second day of retreat saw even more beautiful cultural programs, comprising of dance, vocal and other performances. 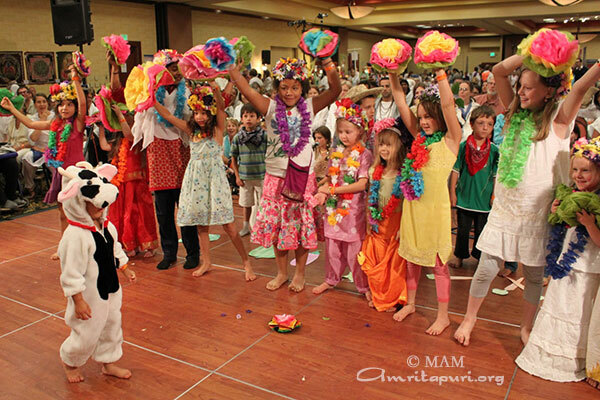 Probably the one that stole the show was a group dance put forth by Amma’s Michigan children. Dressed traditionally, a big group of them danced joyously to the bhajan Anandame Anandam. 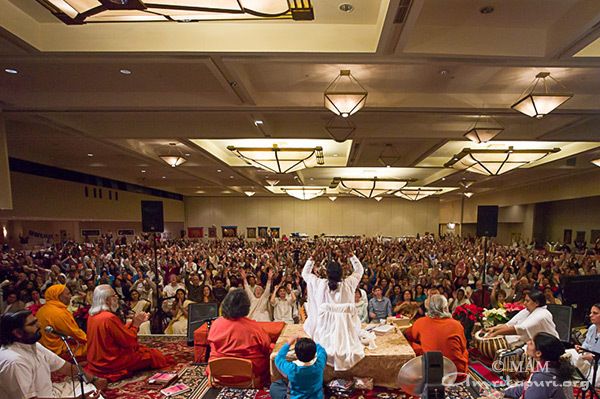 As the song ended, someone announced “now we are going to celebrate Amma’s 60th birthday the ‘Mo-Town’ way.” Amidst cheers, the mood changed and the traditionally dressed dancers began shaking their legs to one of the Stevie Wonder’s popular numbers. Slowly more people joined in and then literally everyone in the hall was up dancing. Watching Her children dancing joyfully Amma threw a couple of “kisses” candies towards them. The excitement reached its peak. All the hands were up in the air to catch the next one coming. And then, there was a shower of “kisses”. The final evening program ended at 10am the following day. 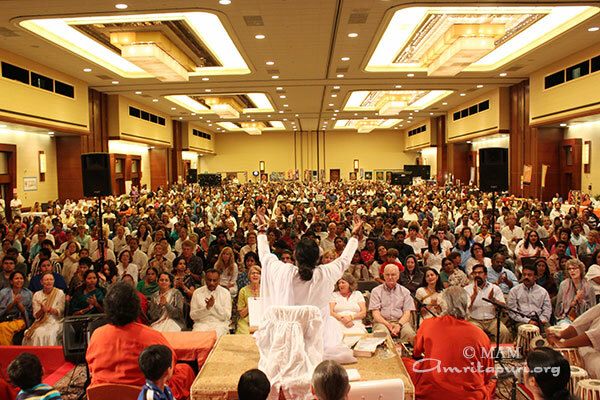 Amma will be back in Amritapuri soon after two months in Europe and North America. 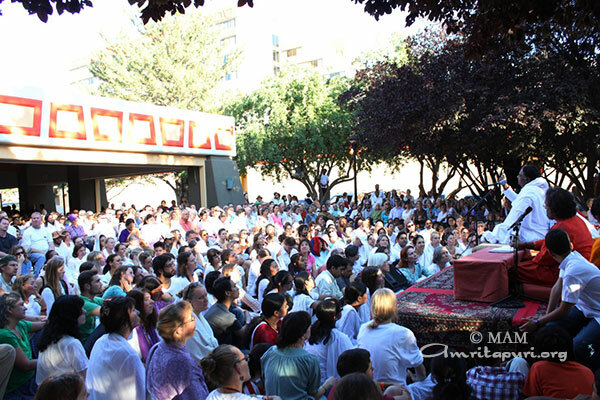 Amma and the group arrived in San Ramon ashram in the evening of Nov 17th after a long flight from Barcelona, Spain. It was a full day of darshan the very next day. The local county had declared a drought for the region, for it had not received rain for months. The very next day, it was pouring heavily. 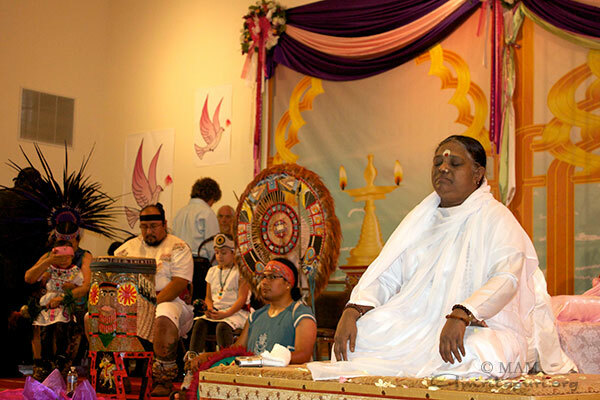 Amma brought with her the heavy rain to quench Mother Earth’s thirst as well as the spiritual thirst of Amma’s children who had been excitedly waiting for her since her visit in the summer. The rains were followed by very high winds for the next two days in combination with the chilly weather. But, as usual, nothing could keep Amma’s children from flocking to the place from even far away. They were ready to wait outside, especially for the final evening program, to get a token for Amma’s darshan. 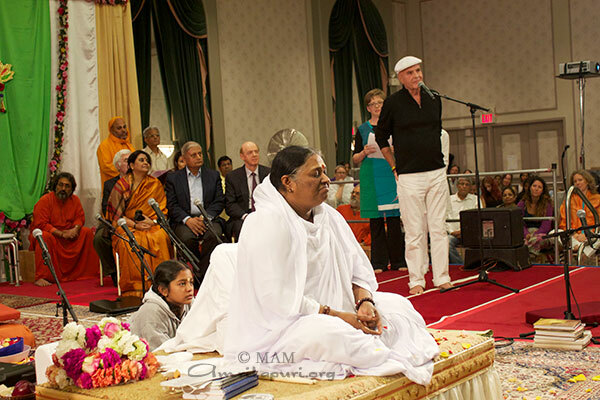 Amma says, “Where there is love, there is no feeling of difficulty and suffering.” One could witness the perfect example here. 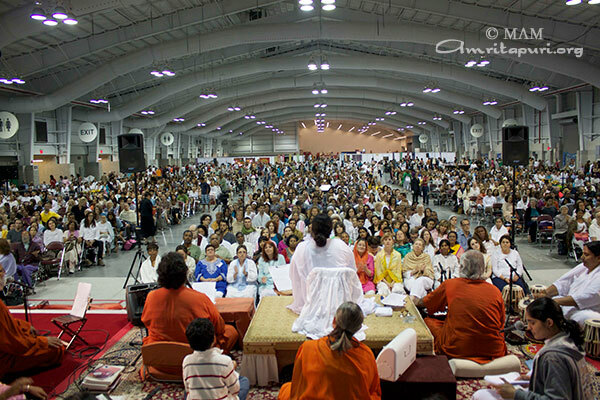 The last three days of the programs was a spiritual retreat with Amma. During the question and answer session on the second day of the retreat, a question was posed asking Amma what should AYUDH (Amrita Yuva Dharma Dhara – the youth wing) kids do to remain focused on Amma and the spiritual practices and principles Amma teaches them. Amma said that today’s youth are the pillars for tomorrow’s world. The young have the potential to make a change in the world. Amma stressed on how the AYUDH children could inspire others by coming together to take initiatives to protect Mother Nature. Amma said that they could organize tree planting drives, initiatives for preserving traditional organic seeds, cleanliness drives etc. It is all about channeling the energy the youth have for the right cause. 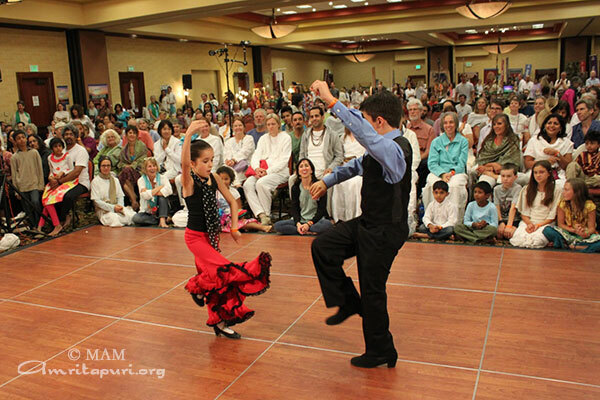 Later, Amma served dinner and after bhajans there was an array of cultural programs put together by Amma’s San Ramon children, comprising of instrumental, vocal, dance performances and a humorous play. The final evening program went on continually for almost 16 hours, ending by 11 am the following day.